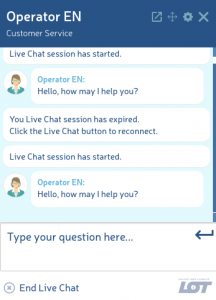 In the era of growing competitiveness of air carriers, LOT, the European airline headquartered in Poland, has extended its customer service with a Live Chat from InteliWISE. Increasing number of customers is choosing chat or messaging over call, whenever in doubt or question. Moreover, the intelligent automation of customer service processes, digitization of distribution channels, the development of online bookings and purchases, as well as higher expectations regarding the quality and customer service standards, lead to numerous investments in new customer care tools in the aviation industry. The world’s largest players perceive the need to expand their service channels also with instant messengers. Customers – especially young people who use social media – are increasingly “texting” instead of “calling”. Communicating with the company via chat is more important to them than contacting via helpline. Live chat is a chat window (or widget), usually located in the lower right corner of the website. The tool allows the company’s consultants to talk to the customer in real time and provide instant answers to incoming inquiries. The potential of this solution is huge. Live chats are already successfully used by airlines such as Emirates – one of the best carriers in the world; Air Asia – the largest low-cost air carrier in Asia, or the well-known Irish airline Ryanair. InteliWISE team was proudly responsible for the ‘turn-key’ implementation and customization of this enterprise-class live chat solution.